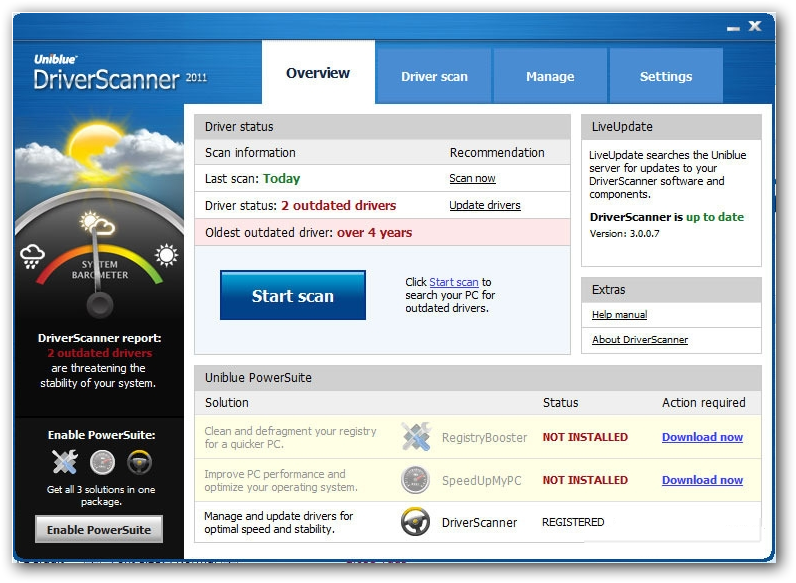 DriverScanner Scan and update your outdated system drivers to release the full power of your PC with Uniblue's powerful new driver download management tool. DriverScanner is the simple and reliable tool with which to update your system’s drivers, boosting system performance, releasing improved functionality and increasing operability with networks and hardware. This powerful application will scan your system to identify drivers to be updated, and deliver the tools you need to download and then install those drivers, while, at the same time, keeping a full record of all activity and allowing you to backup and restore your drivers. Combining a sophisticated system scanning engine with a characteristically elegant, clear and simple-to-use Uniblue styled interface, DriverScanner dramatically improves your computing experience. One mouse click is all that it takes to download and then to install updated drivers to your computer and release the full functionality of your system. 16 Response to "DriverScanner 2011 4.0.1.4 (NEW)"
alguien sabe de algun serial que no este caducado?? gracias x el serial!!!! me funciono PS-FAQ2S-KCVE7-3JWEA-YNUK5-X57S9-D25YZ!!! gracias si me funciono el serial....PS-FAQ2S-KCVE7-3JWEA-YNUK5-X57S9-D25YZ______consejo para otros__intenten con varios en este foro...y activaran el driverscanner... gracias!! Gracias por el programa,esta muy bueno, pero quisiera saber como obtener los otros dos complementos que son: RegistryBooster y SpeeUpMyPc,porfabor, gracias.